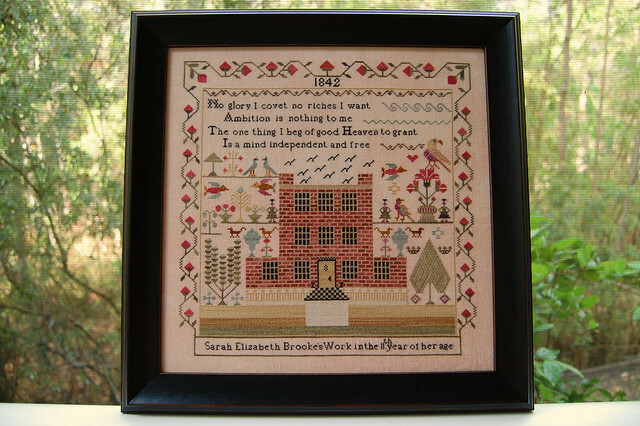 Nicole's Needlework: Sarah Elizabeth Brooke Framed! Beautiful finish on your sampler. I love the simplicity of the frame it really compliments your work. Stunning! It is stunning Nicole. Very nice Nicole!!! If you need some place to hang it, I have just the spot.... just saying! Gorgeous!!! Enjoy it on your wall!!!!! It really is gorgeous, Nicole! I just love it! You should be proud...beautiful finish. Oh, gosh..stunning!! I wish it were mine!!!!! Beautiful Nicole - you should be very happy! Yeah, it is really gorgeous! amazing work! Beautiful stitching and I love the frame! You will have to tell us where you decide to hang it. 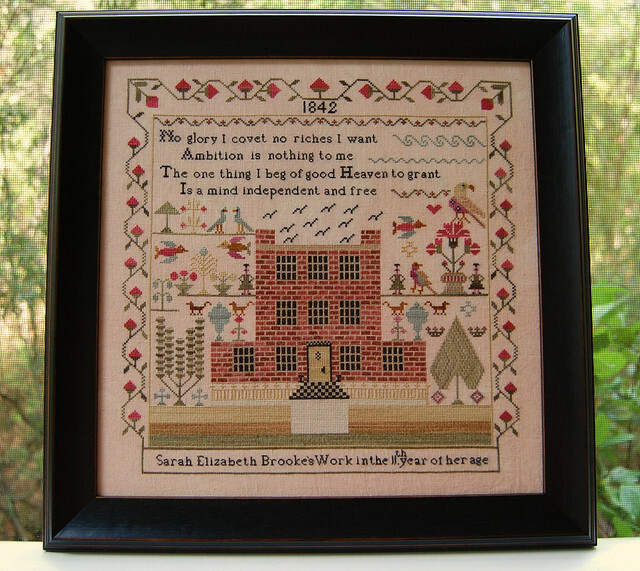 Beautiful frame for your sampler. I love that it's a simple one - it lets the wonderful design and your stitching just shine!! Nice framing!! Mine is due to go out next time I get the cash-ola to have some framing done...Love it!! SEB is beautifully stitched and framed! I'd love to see where you hang it. Just beautiful. I love the simple frame you chose. Beautiful!!!!! Are you by any chance interested in selling the chart?? Lots. of. bricks! BEAUTIFUL piece!! It is beautiful Nicole. The frame compliments the design perfectly! Sarah looks just beautiful in your new frame Nicole!! You must be so happy with it!! I love it! Very pretty, Nicole! I love it! So pretty! I love the frame. What a wonderful project! Perfect in this frame... amazing! Gorgeous! The frame compliments it beautifully. Beautiful! And the frame you chose is perfect. She is completely gorgeous and the frame is perfect!!!! Love it. Beautiful finish in an absolutely stunning frame! Congratulations, Nicole! It turned out beautifully; I LOVE it! Beautiful! Perfect choice - but must have been difficult. Love it! Love it Nicole! Congratulations and enjoy it hanging in your home! Gorgeous!!! The frame you chose really works well! Love seeing all your stitching! Sarah Elizabeth is beautiful! 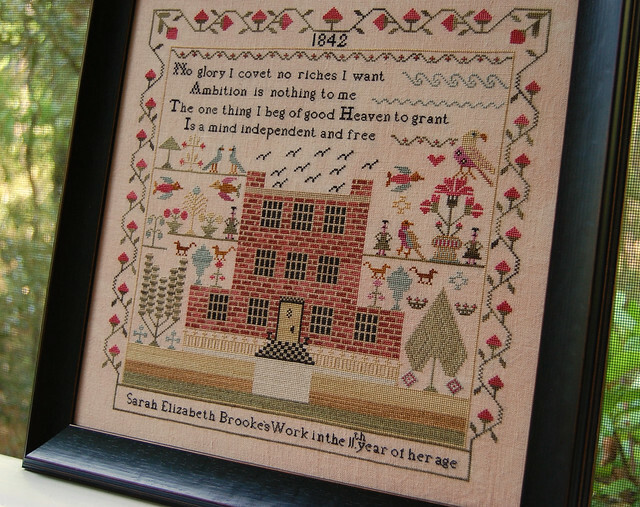 I love the simplicity of the black frame, and as usual your stitching is lovely! Enjoy her! Really, really lovely work Nicole! It looks gorgeous in that frame! Perfect finish for your beautiful sampler! The framing really compliments the stitching and design. It's beautiful Nicole! Your work is gorgeous! Perfect! I think you need to run right back to the frame place and get another one framed. Now! I just love this sampler! She's gorgeous!!! I love the frame you chose. Can't wait to hear where you decide to hang her. What a wonderful sampler! You did a great job with the frame. This is so beautiful. The frame is just perfect ~ congratulations!